I also wanted to take the time to thank the lovely Felicity from "Pursuit Of Felicity" for helping me to tidy up my layout a bit. I felt like my sidebar was a bit cluttered and I'm so happy with the results and changes she has made. I would really recommend her services, as she is so lovely and always very helpful. I would love to know what you think about my updated layout and I hope you all really like it :D - So, now I will get on with my hair care routine. Shampoo and Conditioner - Bargain Alert ! Previously, I have used shampoo's and conditioners from Kerastase, L'Oreal, Aussie and Pantene and have never really been 100% happy. 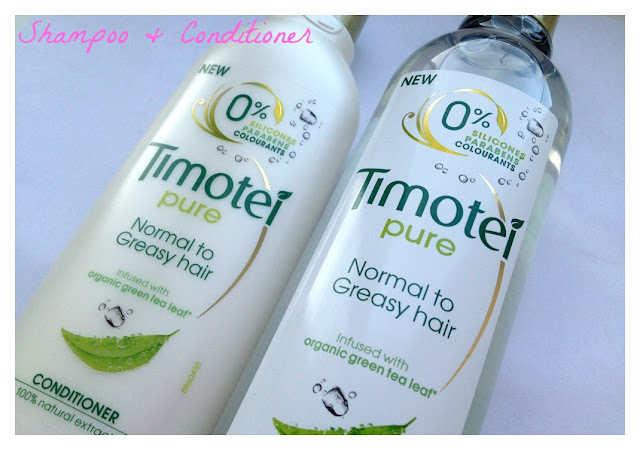 However, I have recently been using Timotei Pure Shampoo and Conditioner which is currently on sale for an amazing £1 each! from supermarkets (I found mine in ASDA) The shampoo and conditioner are free from, paraben's, silicone's and colorants. The shampoo and conditioner are great for normal/greasy hair and are infused with organic Green Tea which makes the hair feel extremely clean after use. The conditioner also leaves my hair feeling amazing and it also has more of a lemon smell which makes it really refreshing to use. I love my current shampoo & conditioner as I can combat greasy hair and dry ends all in one and for an amazing £2! John Freida Root Lift Foam - I was very skeptical about putting product on my roots, as they are very prone to getting greasy. However, I was really surprised that after using this my hair did not become greasy any quicker than it normally would, plus I did notice some more volume after using this product. John Freida Deep Conditioner - This is my favourite product and I have really noticed the quality of my hair from mid-low lengths in comparison to when I wasn't using it. John Freida Perfect Ends - I have been using this on towel dried hair and have found my ends to be a lot of shiny and healthy looking, in comparison to them being very dry and sometimes frizzy. Recently, I have been styling my hair a little more thanks to the lovely results I saw from using the Enrapture totem barrel. I can create so many different curls and I can also create a real quick 10-15 minute look, which is great for when you don't have time to curl your hair properly, If you would like to see the post click Here. I have also been using the OSIS +* flatiner hair protector which has helped to protect my hair from when I have been using heat. 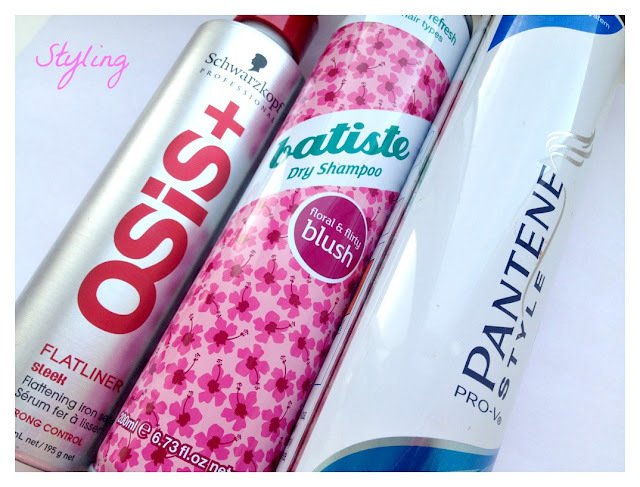 I also use my Batiste dry shampoo to either help freshen my hair up, but also to add an extra bit of volume when I need it. I don't tend to use hairspray that much, but when I do I always opt for Pantene's flexible hold which I find to be light and not sticky. - Use minimal or no heat at all, If you do have to use heat then make sure your protector is good! - I hardly ever use a hair dry my hair! I find that towel drying it and putting it up in a bun really helps to create natural movement. - I personally haven't used it but a few people have said that the Lee Stafford Hair Growth products are quite good. I don't believe this is a miracle product, but I do think it would help your hair grow overtime due to its protein base. wow. your blog looks amazing. i love it and your hair looks so good. i'm so jealous. Wish my hair was longer. I've been using the Lee Stafford hair growth set for a while. Not sure how much difference it has made but it is a nice shampoo, conditioner and treatment! Nice post. I have never tried it :( I can't imagine it will magically work, but maybe the protein base helps to grow it overtime maybe ? wow. your hair is amazing, I was taken back when the picture came up as I scrolled down! My hair would never look like that, even if it was long! Your so lucky! Great post, like I just said to you on twitter, I really need to up my hair care because I've just got rid of some blonde out of it, and obviously it's left my hair in rubbish condition. 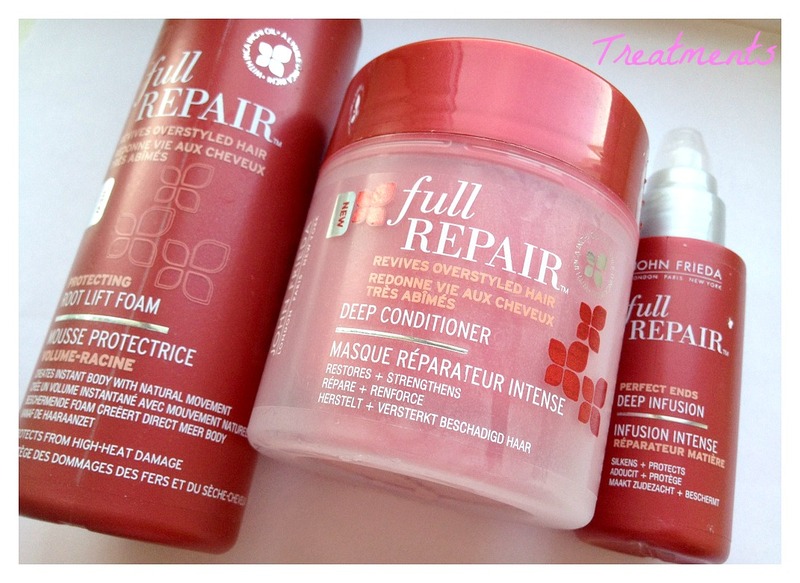 I'm going to definitely try some of the repair products! Great post and I love your blog its very classy and fun. I've never even heard of that shampoo and conditioner, may have to give those a go! ps. 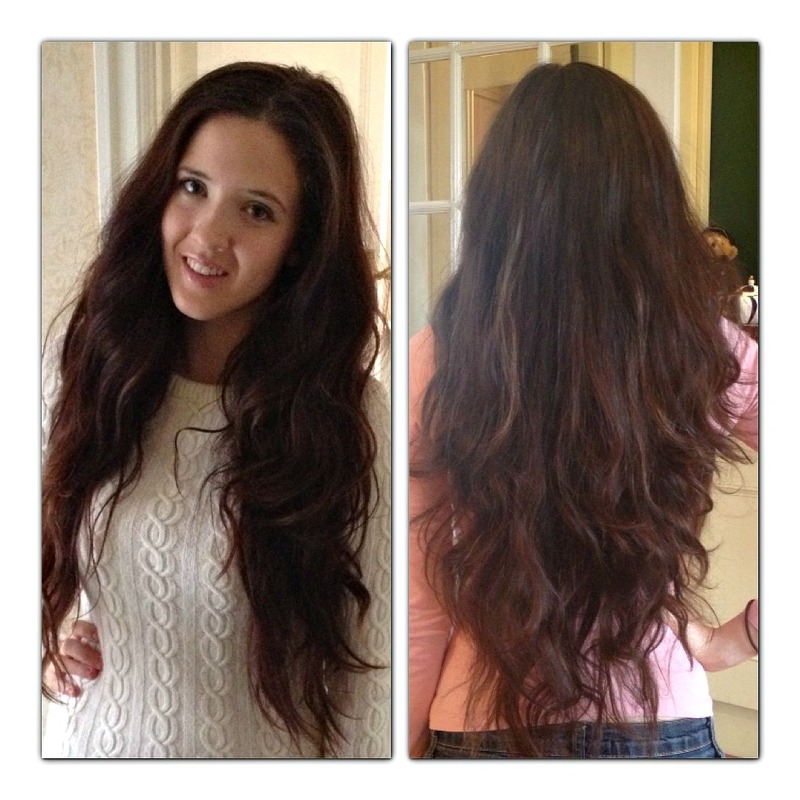 I am utterly jealous of how long and healthy your hair is! I've always seen those Timotei products around but have never picked them up. Definitely will give them a try after this post, my hair is exactly like yours in the whole gets greasy at the top and dry at the ends way! Lovely blog + post! I may start taking collagen as I NEED/WANT long thick hair, great post lovely! you have GORGEOUS hair! i totally agree, i try to use the minimal amount of heat as possible on my hair! it really helps for preventing damage! Great post! Those products seem great and your hair looks gorgeous! I am in the process of growing my hair longer so I really like this post. Your hair is stunning!! :) Love your blog!! I am a new follower btw. I am a fashion blogger.. please come check out my blog! Wow at your hair!! Where did you buy the shampoo and conditioner? Available anywhere online? Hating my split ends atm - your hair is so long and lovely! Be great if you could check out my 1st blog giveaway here where you could win MAC, Jewellery plus other goodies. Hair is considered as the crowning glory so good care of it should be taken. Thank you for stopping by my blog and leaving a comment. I'm now a follower of your fantastic blog. I'm definitely looking forward to reading more. Love your pictures and your hair is absolutely gorgeous, I love it. I also use the JF full repair and I am very happy with the results. Your hair is perfect- looks so helthy, shiny. I just want to say that you have beautiful long hair. I really want to try this!I would like to thank you for sharing your thoughts into the stuff you post!! Thumbs up. For hair that is dry/damaged – and desperately in need of love – I perform a regular deep conditioning treatment! A mixture of 4 tablespoons of conditioner and 3 tablespoons of cold pressed virgin Coconut Oil from Merit VCO works wonders for me! My hair feels so much healthier afterwards, and since using it, it’s almost dandruff-free! I simply work it into myhair when damp, towel wrap, and leave to work its magic for around 2 hours, before rinsing. I treat my hair to this ‘healing session’ every other week, although it would be even more beneficial to do so weekly. Depending on the extent of damage, you might even want to skip the conditioner, applying only Coconut Oil. Since discovering Aloe vera gel and coconut oil I have not looked back. I really recommend giving it a go. I hope you are amazed as I was how easy it is to have good looking hairwithout spending a fortune. packers and movers in faridabad Simler move with movers and packers Faridabad. Best packers and movers Faridabad for home relocation and pet moving. More Detail about Movers Packers Faridabad. Plant Shifting with Best Packers and Movers in Faridabad.